This feature is not available if you have the Starter Plan. Learn More. 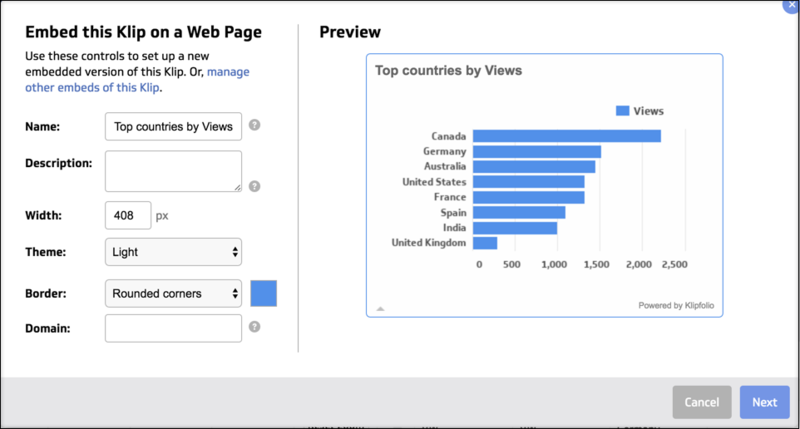 For a seamless experience, publish links to your dashboard instead of embedding Klips. Overview Learn how to generate the code to embed a Klip into an HTML page. Learn how to manage multiple control instances of a Klip. Key Features Includes a security restriction to limit embedding to a specific domain. Permissions You must have Embed Klip and Access Library permissions. Important: Embedded Klips automatically refresh eight times a day, every three hours (when a user is logged into the account). Published links are available if you need your data sources to refresh when you're not logged in. An embedded Klip is one that integrates into an external website or host application in such a way that it appears seamless to the end-user. It allows you to share Klips inside and outside your organization. You can display multiple Klips by embedding multiple control instances within a host application or you can restrict embedding of a Klip to a specific domain. To embed a Klip, you must generate the embed code and copy the provided code into the body of an HTML page. On your dashboard, locate the Klip you want to activate for embedding. On the top right of the Klip, select the Klip 3-dot Menu icon. Description: Used to provide additional information to the user when viewing a Klip. Width: measured in pixels. For example, 320 px. Border styles: rounded, square corners, or none. Choose the color of the boarder. Domain (optional): When specified, the Klip can only be viewed in this domain. Note: You can use the Preview window to see how a Klip looks and adjust the width, border style, and color appropriately. The embed code displays and can be copied for inclusion into an external web page. Important: The snapshot image of the Klip is automatically refreshes eight times a day, every three hours (when a user is logged into the account). Published links are available if you need your data sources to refresh when you're not logged in. Tip: Open and close the drop-down arrow, located at the bottom left of the embedded Klip, to see additional information. For example, the Klip title, description, and date and time last modified. You can view code, delete the embed, or generate new embed code for a Klip on the About this Klip page. Locate and open the Klip you want to manage.